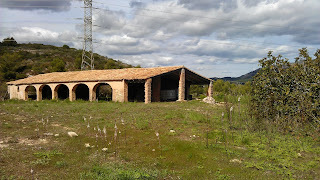 A Riurau is an important part of rural architecture in la Marina Alta, a region in the north of Alicante. 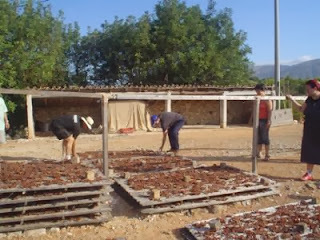 They provide rural houses with the necessary space to store reed mats which are used to dry grapes and produce raisins. Riuraus are usually built facing to the south, the sunniest part of the house. Occasionally they may be found facing to the east but never north or west. A riurau can be attached to a house (like the one seen in the picture above) or it can be detached (like the one seen in the image below) but it will always be facing a large, flat area of land called the "sequer". The "sequer" is an open space used to place reed mats, known as "canyissos", in the sun. Grapes are placed on the canyissos and with the right amount of sun are turned into raisins. If rain or overnight-dew is expected the canyissos are moved into the riurau to keep the grapes dry. Hence the benefit of having the sequer in front of the riurau. The size of riuraus can vary a lot. If a family had a small production of raisins the riurau may only have a single opening or arch. In the case of wealthy land owners and large houses the riurau may have many more openings like the riurau of Benitzaina shown above or the recently refurbished example in Jesús Pobre. 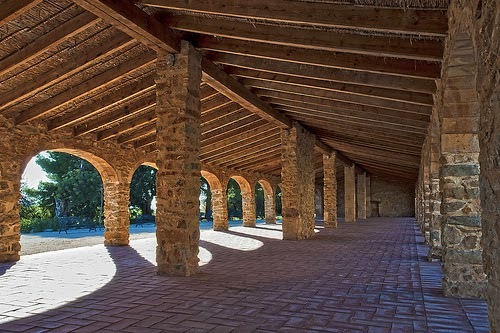 There is evidence that raisins have been cultivated in la Marina Alta since the 15th century but it was in the 19th century when the production of raisins increased considerably due to the British demand. Riuraus seem to have appeared in the 19th century as a response to the needs that the cultivation of the raisins required. It was at this time when the riuraus became part of the landscape of la Marina Alta and the daily life of its people, especially in summer. It was at this time of the year when the families of this region would move to their rural houses (or "casetes") to take care of the production of the raisins. 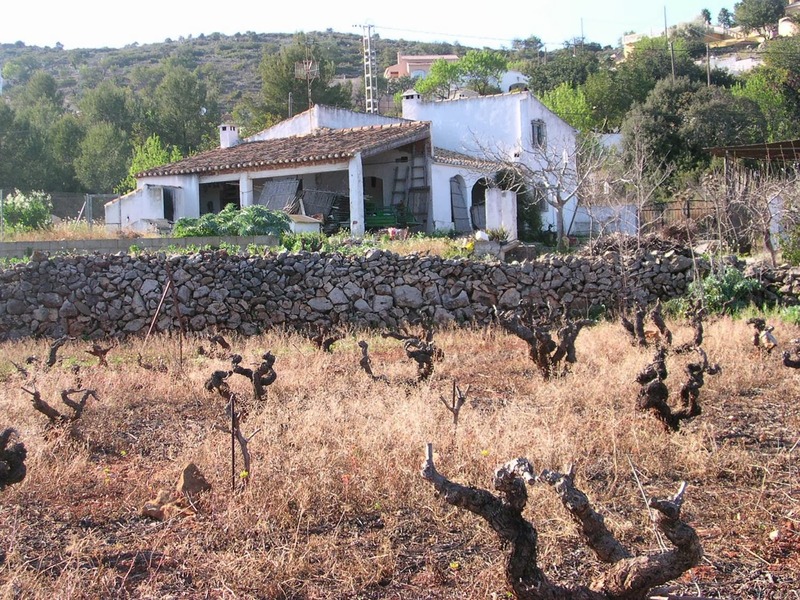 At the beginning of the 20th century, due to the higher competition with other countries and a plague called "fil·loxera" that destroyed most of the grape vines, the production of raisins started decreasing rapidly. Unfortunately without the production of raisins, riuraus weren't needed any longer. 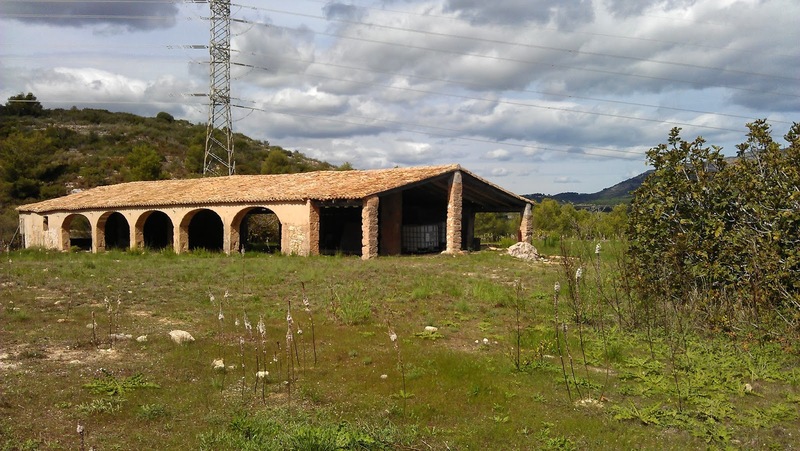 The riurau is still an important part of the landscape and the traditional architecture in la Marina Alta, I would say it has became part of the people's identity. There are many recent constructions that have incorporated riuraus as a part of the modern house. These may not have ever been used to store reed mats but have been designed as an extension of the house towards the outside. A space which provides a cool shaded area in the summer heat. In some other cases houses with original riuraus have been refurbished. Nowadays as more people live in the rural houses all year around (not just for the summer months) many of the riurau openings have been glazed. In winter this offers a warm, bright open space facing south and in summer the glass can be opened to let the breeze flow through the house. In these cases the riurau has became an interior part of the house that is usually used as a living room. I grew up in this region and I remember spending most of my summer days in a riurau. That was the place were the families would meet, the grandmas would knit or weave baskets and the whole family would break almond shells. It was a place to gather together, to tell stories or to play. It was not necessarily the rural place that it used to be but it kept the social aspect that it had always had. Unfortunately many of the original riuraus are now abandoned or becoming derelict. Their traditional use has practically disappeared with the decline in raisin production and too few are being refurbished to counter the rate that they are falling down. AlambiLAB believes that it is a shame to loose these constructions along with the history and memories that are attached to them. We think it is important to maintain these historic buildings and to restore them with care. If you want, we can help you with that. They have great potential and deserve to be there for many more years! alambiLAB are Jaume Miralles and Laia Mulet, architects commited to high quality design that respects the environment. Our aim is to improve people's life with good design. We create architecture in symbiosis with the surroundings and adapted to the client's needs. We are based in Hampshire (UK) and la Marina Alta (Spain). Sketch 1: Jorge Oteiza Museum. Alzuza, Navarra.